This is a perfect time of year to get out foraging in the hedgerows as there is a bountiful supply of fruit and berries, this year has been especially good. You can use these to make delicious liqueurs that will be ready in time for Christmas. Here’s a couple of our favourites. Peel and core apple. Chop into very small pieces. Put into 500ml bottle along with the blackberries and sugar. Top up with vodka. Keep in cool dark place. Shake every week for first month. Then let it sit for 3 months before straining out the fruit and enjoying straight or added to some prosecco. This recipe is from Chris Westgate from Heavenly Hedgerows. Put the sloes in a freezer after picking for a day or two so that the skins burst. This is a great deal quicker than pricking each sloe. Then add the sloes and sugar to a large bottle or Kilner jar and cover with the gin. Keep in a cool dark place and shake every day for the first week and then every week thereafter. 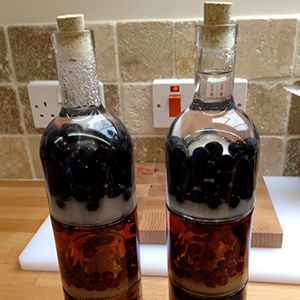 After 3-6 months, depending on how patient you are, strain out the fruit and you have a delicious liqueur! The longer you can wait before drinking it the better it will taste, sloe gin definitely gets better with age.